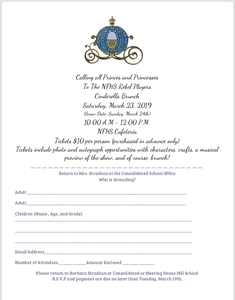 Calling all Princes and Princesses to the New Fairfield High School Rebel Players Cinderella Brunch. Tickets $10 per person - MUST BE PURCHASED IN ADVANCE by March 19! Photo and autograph opportunities with characters, crafts, a musical preview of the show, and of course, brunch. Please return attached form to Barbara Strashun at Consolidated or Meeting House Hill School R.S.V.P and payment are due no later than Tuesday, March 19th.